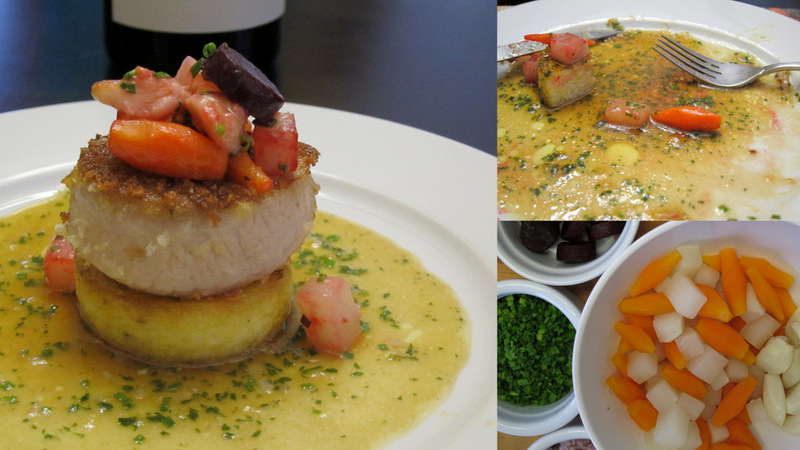 A week before our much awaited dinner at The French Laundry (I’ll post something about that at some point…hopefully soon) I wanted to make the family a meal from one of my favorite cookbooks. I thought of it as an appetizer of sorts. Of course my meal was not a 10 course 4-hour extravaganza but only a couple of courses, a main dish and a dessert. When both come out so perfectly delicious though, it really is a treat. In the book there are several recipes for “cheap” cuts of meat, not just pricey and exotic cuts. Chef Keller uses cuts like beef cheeks, tripe, pig head and transforms them into refined three-star plates of beautiful food. This is such a recipe. I’ll post about the dessert in a subsequent post. 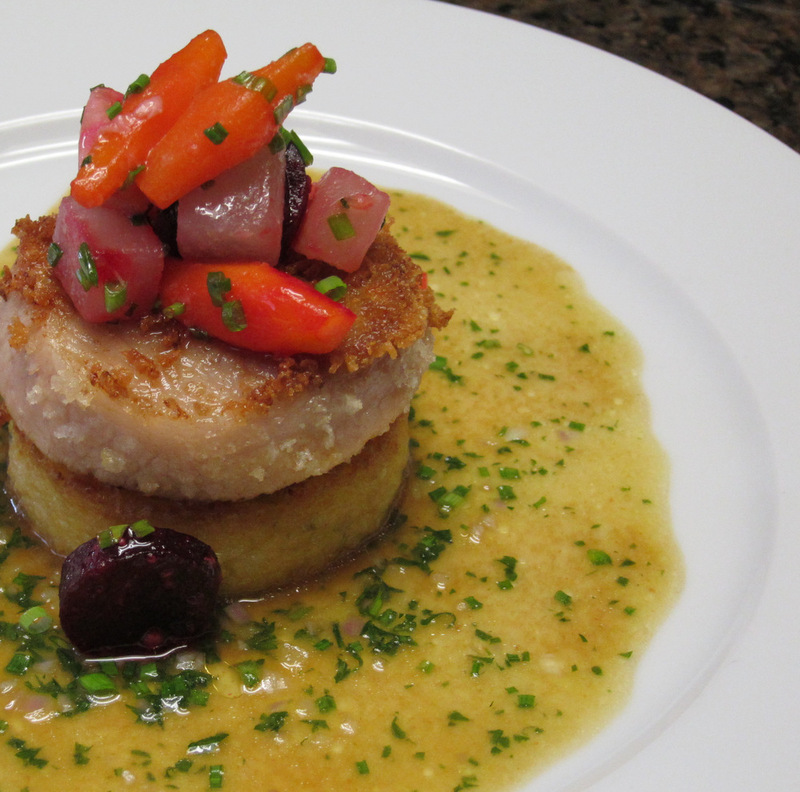 In the book, the recipe is made with veal breast. That’s, more or less, the equivalent of a pork belly on a calf. It’s tough, sinewy and flavorful. It’s also very tough to find at almost any store. I was not about to mail order it so I decided to improvise and see what I have in my deep freezer. I had two excellent pork cheeks in there and I figured these would make a very nice substitute for the veal breast. The recipe, from Keller’s pre sous vide days, braises the meat traditionally (sear, cook in stock with aromatics gently). I opted to first sear the meat really well and then bagged it with carrots, celery, leeks, herbs, stock and white wine and cooked it sous vide at 82.2 C for about 8 hours. When the meat is cooked I removed it from the bag, discarded all the herbs and vegetables and strained the liquid to make a sauce from it later on. The meat went in the fridge to rest and set. To complete the meat portion, I cut the cheeks into 2 inch rounds using a biscuit/cookie cutter. 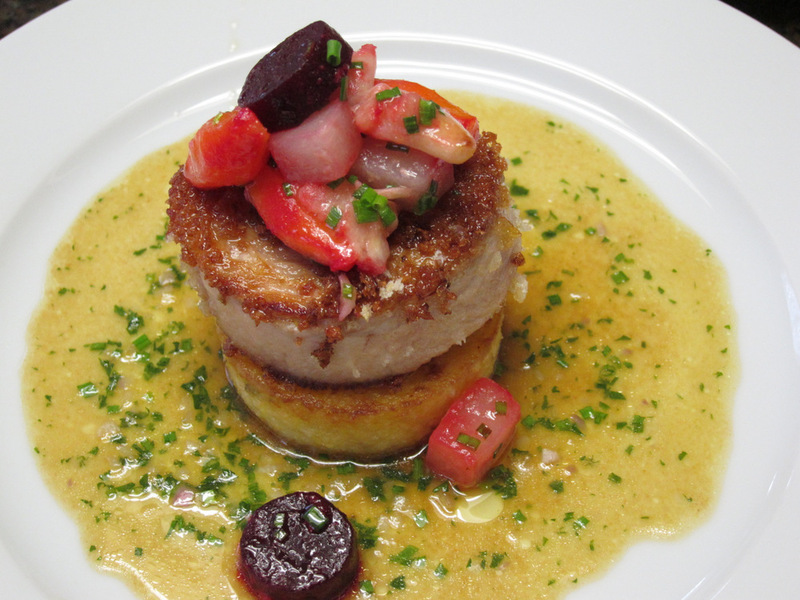 The cheeks are not as nice and even as a veal breast would be. See this post for an idea how the cooked cheeks look in one of the pictures. So some pieces were more even than others. Right before serving, I rubbed the meat with Dijon mustard and then rolled the flat sides in panko bread crumbs. Then I pan fried them well in grape seed oil and got them ready for plating. The meat from pork cheeks is really something special. It has a very deep almost slightly gamy flavor and unique texture. Braising the meat then pan frying it till crispy and luscious on the inside. Cutting the meat into rounds creates a good bit of extra chunks and uneven pieces that I used for the next few days in fried rice and tacos for the best ever crispy carnitas. 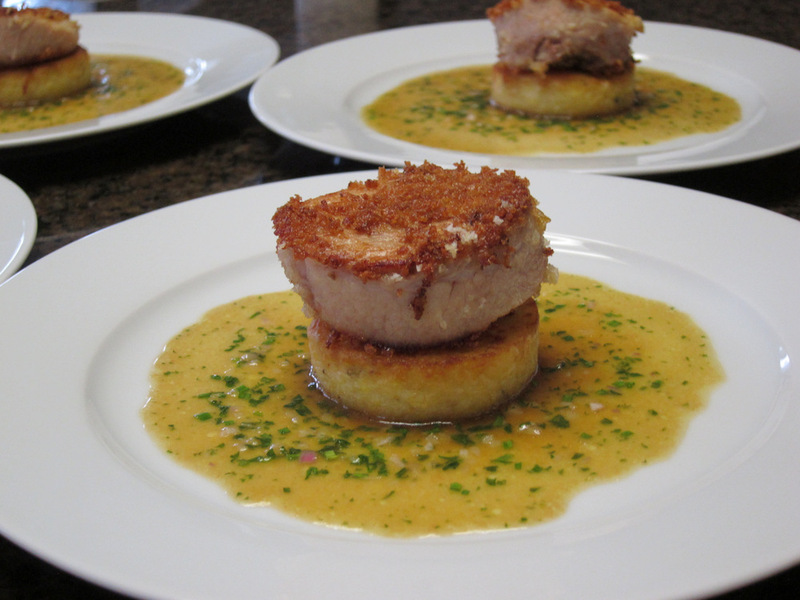 The rounds of pork sit on crispy corn cakes, aka polenta cakes. These are fairly classic made with polenta cooked in water and enriched with mascarpone cheese and butter. I then mixed in some chopped chives and poured the porridge in a silicone square cake pan to set. 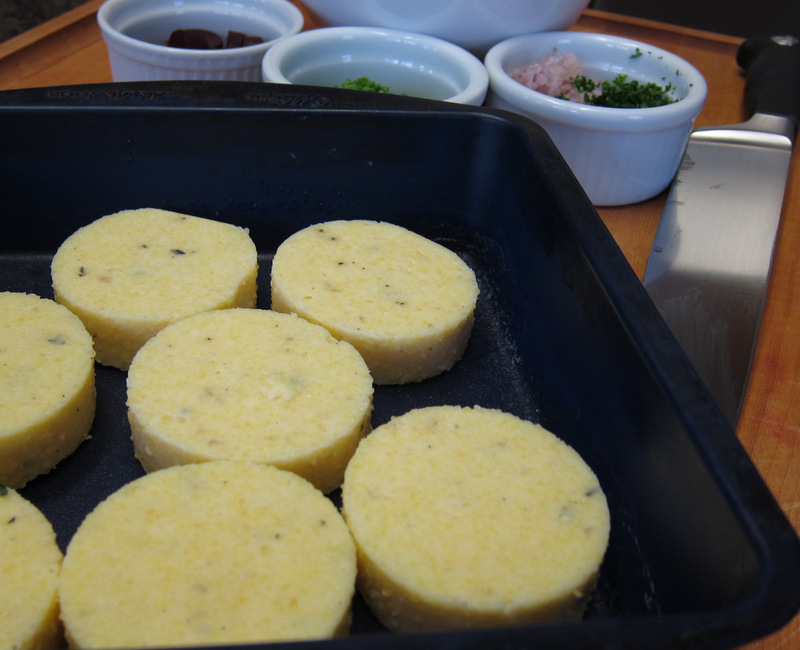 The cakes are finished similarly to these hominy cakes by rolling in flour and pan frying in some butter until browned and crisped. The vegetables in the book (carrots, turnips, celery root, beets) according to the recipe are supposed to be cut into different shapes. The beets into tiny pea-size marbles (parisienne), the carrots into small ovals (turned), the trunips into small fluted shapes and the celery root into small batons. So, I have no parisienne cutter and no vegetable fluter. 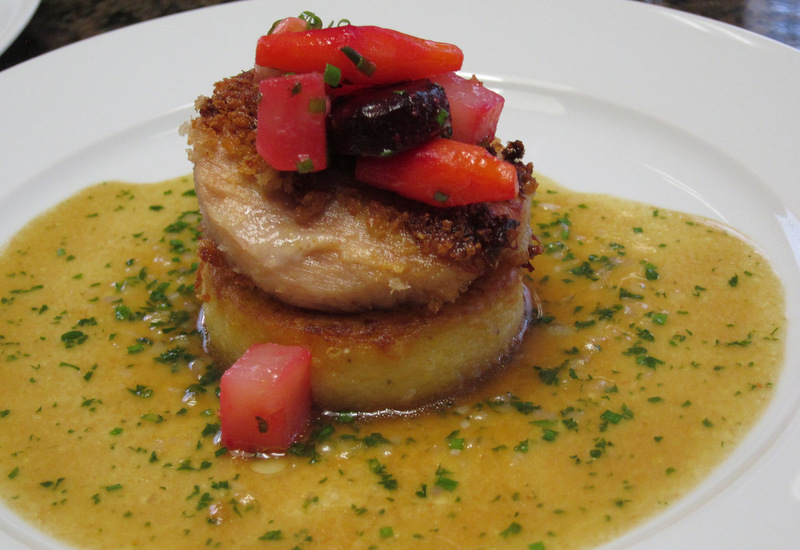 I also opted not to use the the celery root since I did not have a kitchen brigade doing my bidding. 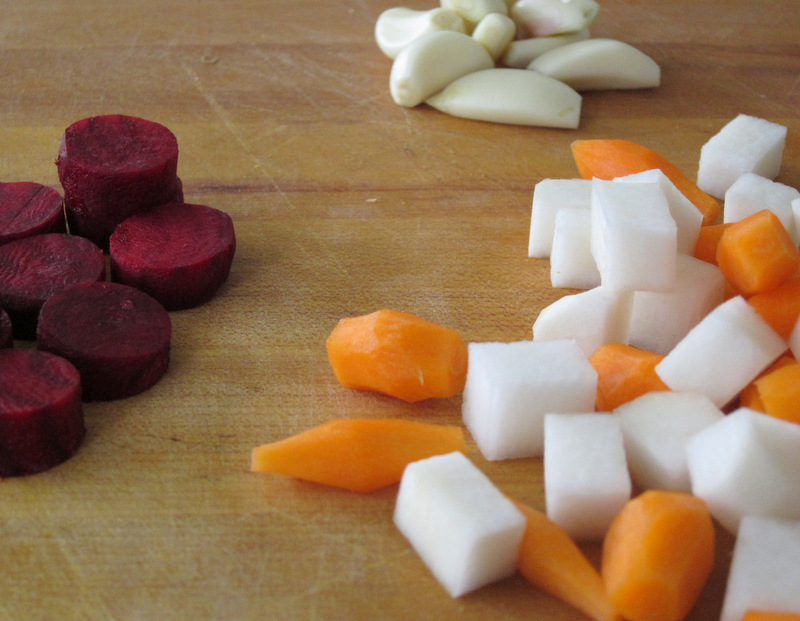 Instead I cut the beets into small coin shapes and the turnips into small cubes. Then I turned the carrots. It really takes some time and skill to turn hard vegetables into acceptable small football shapes. It really makes one appreciate all the work that goes into creating and executing one of those dishes at a place like the French Laundry. It took me about an hour to make maybe 20 carrot ovals and they were by no means perfect. Chef Keller in the recipe blanches the vegetables separately to cook them. Instead I bagged the carrots and turnips together and separate from the beets (to avoid discoloration since beets really stain) and then cooked the two packages sous vide at 85C until perfectly tender. To finish the vegetables and plate them they get sauteed in some butter and sugar to glaze them (again the beets are glazed separately) and then they are warmed in a small pot of beurre monte, Keller’s ubiquitous butter-water emulsion. The last vegetable in the mix is the sweet garlic. These are garlic cloves blanched in several changes of boiling water and then slowly poached until very soft and then sauteed in butter to brown them and further flavor them. The garlic and the rest of the vegetables get tossed together at the last minute, right before serving. If I could change one thing about this recipe, it would be that last step of tossing in the beets. Even with all the care and even though the beet coins were mixed in at the last second, they still managed to slightly stain the turnips and garlic a shade of pink. Really I should’ve plated the beets without tossing with everything else.